One of the topics I haven't addressed yet are plastics and their impact on your health. It's important for all people, but especially impacts those who are more sensitive to external toxins such as....people with food allergies! :) It just makes sense to protect your food environment as best you can when your system is already vulnerable. For some reason, the green/environmental movement, while making progress, has not given this topic much press. It's certainly pretty easy to understand that household chemicals such as spray cleaners, paint, solvents, mothballs, air fresheners and dry cleaning chemicals let off gasses which negatively impact your health. They emit Volatile Organic Compounds (VOCs) into the air, which accumulate into our bodies over time. You can learn more on VOCs from the EPA (Environmental Protection Agency) here. What's not so commonly known, however, is that common household plastics in water bottles, baby bottles and other food containers leach toxins into foods (remember osmosis in school?) that accumulate into our bodies over time as well. While the FDA has been slow to recognize the effect of plastics on our health, a panel of the NIH (US National Institutes of Health) has indicated it poses a risk to humans (specifically on developmental and reproductive health). See NIH article on one particularly bad type, BPAs (Bisphenol A), here. (I'm personally not gonna wait until the government makes this official, who knows if and when that will happen? Also plastics are petroleum-based products, which opens another can of worms that would take too long to address here.) While we can't completely avoid all plastics in our lives, it's critical to ensure that we try to minimize its contact with food. Plastics release even more toxins when heated, so please don't microwave food in plastic containers because it accelerates the migration of toxins into your food! Transfer food to glass or ceramic dishes before microwaving. (2) Use disposable water bottles only once, don't refill them and reuse since they're designed only to be used once and can leach into the water over time. Use the new stainless water bottles instead. (3) Try to reduce the use of plastic wraps, these have higher levels of BPAs. For microwaving, use waxed paper or parchment paper. Glad and Saran Wraps are promoted as being free of BPA and PVC–but remember that these plastics live for 1,000 years in our landfills. (4) Replace plastic containers with glass and metal storage containers. 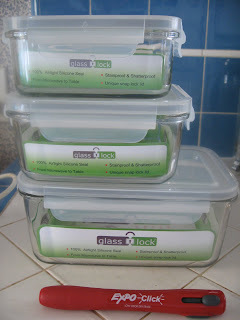 Although I've tried metal storage pieces, the GlassLock type is my absolute FAVORITE. I can see what's inside, the glass doesn't add anything to the food, and the silicone lids seal airtight and are easily washed. Another benefit is that you can use non-toxic markers on the containers in case you need to separate allergic and non-allergic foods for your family! (BTW, I discovered there are several brands using the name GlassLock, I have both the Wellbeing and Kinetic brands.) You can see these on my Amazon "I recommend" widget on the right hand side of my blog. Also, I just saw an 18 piece set at Costco for $29.99 which is a SUPER deal, much better than I got at Bed Bath and Beyond. The only problem I've found so far is that these are a little on the heavy side when I bring my lunch somewhere, so I just got a stronger bag. What do the plastic numbers mean? Thanks to my good friend Mary Cordaro, an environmental consultant in Los Angeles, who taught me all this important stuff! Please share this news with friends and family to let them know how easy it is to improve their health and help the environment right now. THis is great! We have been on our green journey as a family since our son was an infant. He had terrible food allergies and intolerances and severe Eczema. He has been helped dramatically by taking a children's chewable probiotic called Belly Boost and he no longer suffers from Eczema. It has been a miracle! This has led us down a path of living as natural as possible and we just eliminated our plastics among many other things. They are awful - and we only use glass! Thanks for the info on recycling! I bought the Costco glasslocks and they are good. However, they are SO HEAVY as you said. I've been putting off using them because I bring my lunch every day and these are so very very heavy to carry. Thank you for the reminder that the plastics are bad for me. Kathyin MD, so glad you like the glasslocks! The Costco price was so good I was upset that I already had so much! I think I paid anywhere from $9-$12 each! Pass on the word about plastics to your family and friends!